These gorgeous little herbivores are more than just outdoor lawnmowers. Guinea pigs make wonderful pets that thrive as our companions. Their increasing popularity is boosted by their compact size, friendly nature and distinct personalities. They even come in a range of colours and coat types. Guinea pigs require time and effort to be maintained in good health. Many of the guinea pig problems we see here at BBEVS are related to their diet or general care. In the wild, lots of hungry carnivores would think of guinea pigs as dinner, so just like our other exotic species, guinea pigs hide signs of disease and injury. To learn more about how to keep your guinea pig healthy go to the tabs below for Guinea Pig Health Examinations, General Guinea Pig Care and the Vitamin C Calculator. A cornerstone of maintaining wellness in guinea pigs is regular preventative health examinations. These examinations use a combination of physical examination and diagnostic testing to assess your pet for any early signs of disease, as early identification of disease provides the best chance of successful resolution. 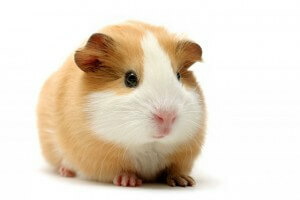 See Guinea Pig Health Examinations. We also recommend veterinary assessment of all new pets. This is important for early identification of abnormalities and is particularly relevant if you already own guinea pigs, as some diseases can spread rapidly from the new arrival to the other animals in your household. If you are new to guinea pig ownership, this initial consultation will ensure that you start your ownership armed with the most up-to-date knowledge for this particular species. We require blood donors! Occasionally we require fresh blood from healthy guinea pigs to perform a blood transfusion for a sick guinea pig patient. In order to be a blood donor, your pet must be an adult, have regular veterinary health examinations with BBEVS and be currently in good health. To have your pet placed on this life-saving register, please contact (07) 3217 3533. A health examination is an important part of keeping your guinea pig healthy and happy. We recommend 6 monthly veterinary checks. At these visits we will discuss your guinea pig’s living arrangements, diet and preventative health care program. A full physical examination, including faecal and dental exam will be performed. One of the most important parts of the physical examination is assessment of your guinea pig’s dentition. Diseases of the molars are all too common and prevention far better than treatment. Nail trimming is performed at these visits if required. Listed below are descriptions of common laboratory tests that are recommended and can be performed during the Guinea Pig Health Examination. Many of these tests may be recommended for diagnostic purposes if your guinea pig ever becomes unwell and it is always ideal to have a ‘baseline’ or normal values for your pet to compare these to in times of illness. Test Type How is the test performed? What does the test show? When is this test recommended? Faecal examination Microscope exam of the faeces. Parasites. Yeast levels. All Guinea Pigs. Oral examination Microscope exam of oral swabs. Bacterial levels. Yeast levels. Some Guinea Pigs. Biochemistry Blood sample Liver function. Electrolyte levels. Some Guinea Pigs. Call us on 07 3217 3533 immediately. Please note that we run by appointments. We endeavour to provide all our patients with an appointment time to avoid delays. Emergencies will be triaged by our experienced nursing staff when you arrive. See Contact Us for further information on our opening hours and location. Outside of these hours contact the Animal Emergency Centre in (AES) Underwood on 07 3423 1888. Place the animal in a secure travel container (or regular cage if possible) and keep this covered to reduce stress levels in your pet. Weight of Guinea Pig (grams): Pregnant? Lactating? Ill? Growing? Complete all fresh foods given, then press the ‘calculate’ button below. If the results are positive, then well done! Your guinea pig is getting sufficient vitamin C! Remember to recheck the results if the diet changes, if the guinea pig’s status changes (eg becomes pregnant or unwell) or if your guinea pig’s weight changes. It is a good idea to take the vitamin C test every 3 months! If the result is negative, then your guinea pig is not getting sufficient vitamin C. You will need to either change or increase the amount of vitamin C rich vegetables, or supplement with additional vitamin C. We stock 50mg vitamin C tablets, as well as a range of hay and pellets specifically designed for guinea pigs.